My Creative View: Dude, Who Cut the Cheese? Dude, Who Cut the Cheese? Good morning! We all have our process, our reasons for choosing the products that we do when we work on a layout, whether you realize it or not. Some of this process can come easily, other parts can be a real struggle. Today's new article on the Get It Scrapped blog shares masteries in that process. Page titles come easily to me, and often, they are humorous, sometimes they are puns. I use the humor in the titles to draw the viewer into my page. I also use the humor to help me choose product that leverages that humor even more across the page. The title here is something a 10 year old boy would say. The embellishments also use words that mimic that idea. 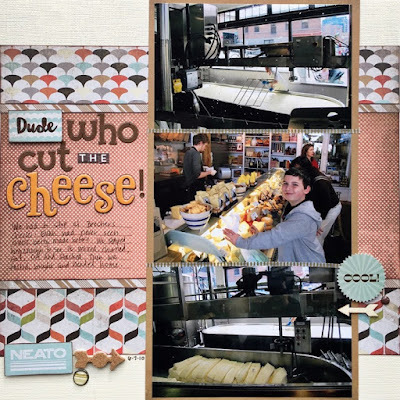 While visiting Pike Place Market for the first time, we stopped at Beecher's Cheese, and watched cheese being made. He had never seen this before. We all were mesmerized. This was our first stop after our long cross country drive. We picked up the keys to our new house, went to the first Starbucks, wandered a bit more, then headed home for the first time. Thanks for stopping by my creative view today. I've been busy and have many pages to share so come back again soon. I knew exactly where that picture was taken before I read your post. Ahhhhh, the memories. Love the title! You do come up with some of the best ones.